Proprietary Name: Transderm Scop What is the Proprietary Name? The proprietary name also known as the trade name is the name of the product chosen by the medication labeler for marketing purposes. Non-Proprietary Name: Scopolamine What is the Non-Proprietary Name? The non-proprietary name is sometimes called the generic name. The generic name usually includes the active ingredient(s) of the product. Transderm Scop with NDC 0067-4346 is a a human prescription drug product labeled by Glaxosmithkline Consumer Healthcare Holdings (us) Llc. The generic name of Transderm Scop is scopolamine. The product's dosage form is patch, extended release and is administered via transdermal form. Dosage Form: Patch, Extended Release - A drug delivery system in the form of a patch that releases the drug in such a manner that a reduction in dosing frequency compared to that drug presented as a conventional dosage form (e.g., a solution or a prompt drug-releasing, conventional solid dosage form). Product Type: Human Prescription Drug What kind of product is this? Indicates the type of product, such as Human Prescription Drug or Human Over the Counter Drug. This data element matches the “Document Type” field of the Structured Product Listing. What is the Active Ingredient(s) List? This is the active ingredient list. Each ingredient name is the preferred term of the UNII code submitted. The inactive ingredients are all the component of a medicinal product OTHER than the active ingredient(s). The acronym "UNII" stands for “Unique Ingredient Identifier” and is used to identify each inactive ingredient present in a product. What are the Administration Route(s)? The translation of the route code submitted by the firm, indicating route of administration. Transdermal - Administration through the dermal layer of the skin to the systemic circulation by diffusion. What is a Pharmacological Class? These are the reported pharmacological class categories corresponding to the SubstanceNames listed above. What is the Labeler Name? Name of Company corresponding to the labeler code segment of the Product NDC. FDA Application Number: NDA017874 What is the FDA Application Number? 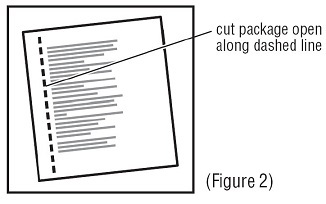 This corresponds to the NDA, ANDA, or BLA number reported by the labeler for products which have the corresponding Marketing Category designated. If the designated Marketing Category is OTC Monograph Final or OTC Monograph Not Final, then the Application number will be the CFR citation corresponding to the appropriate Monograph (e.g. “part 341”). For unapproved drugs, this field will be null. Marketing Category: NDA - A product marketed under an approved New Drug Application. What is the Marketing Category? Product types are broken down into several potential Marketing Categories, such as NDA/ANDA/BLA, OTC Monograph, or Unapproved Drug. One and only one Marketing Category may be chosen for a product, not all marketing categories are available to all product types. Currently, only final marketed product categories are included. The complete list of codes and translations can be found at www.fda.gov/edrls under Structured Product Labeling Resources. Start Marketing Date: 03-01-2019 What is the Start Marketing Date? This is the date that the labeler indicates was the start of its marketing of the drug product. Listing Expiration Date: 12-31-2020 What is the Listing Expiration Date? This is the date when the listing record will expire if not updated or certified by the product labeler. Exclude Flag: N What is the NDC Exclude Flag? This field indicates whether the product has been removed/excluded from the NDC Directory for failure to respond to FDA’s requests for correction to deficient or non-compliant submissions. Values = ‘Y’ or ‘N’. * Please review the disclaimer below. The product labeling information includes all published material associated to a drug. Product labeling documents include information like generic names, active ingredients, ingredient strength dosage, routes of administration, appearance, usage, warnings, inactive ingredients, etc. Transderm Scōp is indicated in adults for the prevention of: •nausea and vomiting associated with motion sickness. •post-operative nausea and vomiting (PONV) associated with recovery from anesthesia and/or opiate analgesia and surgery. •Each Transderm Scōp transdermal system is formulated to deliver in vivo approximately 1 mg of scopolamine over 3 days. •Only wear one transdermal system at any time. •Do not cut the transdermal system. •Apply the transdermal system to the skin in the postauricular area (hairless area behind one ear). •After the transdermal system is applied on the dry skin behind the ear, wash hands thoroughly with soap and water and dry hands [see Warnings and Precautions (5.6)]. •If the transdermal system becomes displaced, discard the transdermal system, and apply a new transdermal system on the hairless area behind the other ear. •Upon removal, fold the used transdermal system in half with the sticky side together, and discard in household trash in a manner that prevents accidental contact or ingestion by children, pets or others. Motion SicknessApply one Transderm Scōp transdermal system to the hairless area behind one ear at least 4 hours before the antiemetic effect is required – for use up to 3 days. If therapy is required for longer than 3 days, remove the first transdermal system and apply a new Transderm Scōp transdermal system behind the other ear.PONVFor surgeries other than cesarean section: Apply one Transderm Scōp transdermal system the evening before scheduled surgery. Remove the transdermal system 24 hours following surgery. Transderm Scōp is contraindicated in patients with: •angle closure glaucoma [see Warnings and Precautions (5.1)]. •hypersensitivity to scopolamine or other belladonna alkaloids or to any ingredient or component in the formulation or delivery system. Reactions have included rash generalized and erythema [see Adverse Reactions (6.2), Description (11)]. The mydriatic effect of scopolamine may cause an increase in intraocular pressure resulting in acute angle closure glaucoma. Monitor intraocular pressure in patients with open angle glaucoma and adjust glaucoma therapy during Transderm Scōp use, as needed. Advise patients to immediately remove the transdermal system and contact their healthcare provider if they experience symptoms of acute angle closure glaucoma (e.g., eye pain or discomfort, blurred vision, visual halos or colored images in association with red eyes from conjunctival congestion and corneal edema). Psychiatric Adverse ReactionsScopolamine has been reported to exacerbate psychosis. Other psychiatric reactions have also been reported, including acute toxic psychosis, agitation, speech disorder, hallucinations, paranoia, and delusions [see Adverse Reactions (6.2)]. Monitor patients for new or worsening psychiatric symptoms during treatment with Transderm Scōp. Also, monitor patients for new or worsening psychiatric symptoms during concomitant treatment with other drugs that are associated with similar psychiatric effects [see Drug Interactions (7.1)].SeizuresSeizures and seizure-like activity have been reported in patients receiving scopolamine. Weigh this potential risk against the benefits before prescribing Transderm Scōp to patients with a history of seizures, including those receiving anti-epileptic medication or who have risk factors that can lower the seizure threshold. Cognitive Adverse ReactionsScopolamine can cause drowsiness, disorientation, and confusion. Discontinue Transderm Scōp if signs or symptoms of cognitive impairment develop. Elderly and pediatric patients may be more sensitive to the neurological and psychiatric effects of Transderm Scōp. Consider more frequent monitoring during treatment with Transderm Scōp in elderly patients [see Use in Specific Populations (8.5)]. Transderm Scōp is not approved for use in pediatric patients [see Use in Specific Populations (8.4)].Hazardous ActivitiesTransderm Scōp may impair the mental and/or physical abilities required for the performance of hazardous tasks such as driving a motor vehicle, operating machinery or participating in underwater sports. Concomitant use of other drugs that cause central nervous system (CNS) adverse reactions (e.g., alcohol, sedatives, hypnotics, opiates, and anxiolytics) or have anticholinergic properties (e.g., other belladonna alkaloids, sedating antihistamines, meclizine, tricyclic antidepressants, and muscle relaxants) may increase this effect [see Drug Interactions (7.1)]. Inform patients not to operate motor vehicles or other dangerous machinery or participate in underwater sports until they are reasonably certain that Transderm Scōp does not affect them adversely. Eclamptic seizures have been reported in pregnant women with severe preeclampsia soon after injection of intravenous and intramuscular scopolamine [see Use in Specific Populations (8.1)]. Avoid use of Transderm Scōp in patients with severe preeclampsia. Scopolamine, due to its anticholinergic properties, can decrease gastrointestinal motility and cause urinary retention. Consider more frequent monitoring during treatment with Transderm Scōp in patients suspected of having intestinal obstruction, patients with pyloric obstruction or urinary bladder neck obstruction and patients receiving other anticholinergic drugs [see Drug Interactions (7.2)]. Discontinue Transderm Scōp in patients who develop difficulty in urination. Discontinuation of Transderm Scōp, usually after several days of use, may result in withdrawal symptoms, such as disturbances of equilibrium, dizziness, nausea, vomiting, abdominal cramps, sweating, headache, mental confusion, muscle weakness, bradycardia and hypotension. The onset of these symptoms is generally 24 hours or more after the transdermal system has been removed. Instruct patients to seek medical attention if they experience severe symptoms. Scopolamine can cause temporary dilation of the pupils resulting in blurred vision if it comes in contact with the eyes.Advise patients to wash their hands thoroughly with soap and water and dry their hands immediately after handling the transdermal system [see Dosage and Administration (2.1)]. Transderm Scōp contains an aluminized membrane. Skin burns have been reported at the application site in patients wearing an aluminized transdermal system during an MRI scan. Remove Transderm Scōp before undergoing an MRI. The concurrent use of Transderm Scōp with other drugs that cause CNS adverse reactions of drowsiness, dizziness or disorientation (e.g., sedatives, hypnotics, opiates, anxiolytics and alcohol) or have anticholinergic properties (e.g., other belladonna alkaloids, sedating antihistamines, meclizine, tricyclic antidepressants, and muscle relaxants) may potentiate the effects of Transderm Scōp [see Warnings and Precautions (5.2)]. Either Transderm Scōp or the interacting drug should be chosen, depending on the importance of the drug to the patient. If the interacting drug cannot be avoided, monitor patients for CNS adverse reactions. Concomitant use of scopolamine with other drugs having anticholinergic properties may increase the risk of CNS adverse reactions [see Drug Interactions (7.1)], intestinal obstruction and/or urinary retention. Consider more frequent monitoring during treatment with Transderm Scōp in patients receiving anticholinergic drugs [see Warnings and Precautions (5.2, 5.4)]. Transderm Scōp, as an anticholinergic, may delay gastric and upper gastrointestinal motility and, therefore, the rate of absorption of other orally administered drugs. Monitor patients for modified therapeutic effect of concomitant orally administered drugs with a narrow therapeutic index. Scopolamine will interfere with the gastric secretion test. Discontinue Transderm Scōp 10 days prior to testing. Risk SummaryAvailable data from observational studies and postmarketing reports with scopolamine use in pregnant women have not identified a drug associated risk of major birth defects, miscarriage, or adverse fetal outcomes. Avoid use of Transderm Scōp in pregnant women with severe preeclampsia because eclamptic seizures have been reported after exposure to scopolamine (see Data).In animal studies, there was no evidence of adverse developmental effects with intravenous administration of scopolamine hydrobromide revealed in rats. Embryotoxicity was observed in rabbits at intravenous doses producing plasma levels approximately 100 times the levels achieved in humans using a transdermal system. The estimated background risk of major birth defects and miscarriage for the indicated population is unknown. All pregnancies have a background risk of birth defect, loss, or other adverse outcomes. In the U.S. general population, the background risk of major birth defects and miscarriage in clinically recognized pregnancies is 2% to 4% and 15% to 20%, respectively.DataHuman DataEclamptic Seizures In published case reports, two pregnant patients with severe preeclampsia were administered intravenous and intramuscular scopolamine, respectively, and developed eclamptic seizures soon after scopolamine administration [see Warnings and Precautions (5.3)]. Animal DataIn animal reproduction studies, when pregnant rats and rabbits received scopolamine hydrobromide by daily intravenous injection, no adverse effects were observed in rats. An embryotoxic effect was observed in rabbits at doses producing plasma levels approximately 100 times the levels achieved in humans using a transdermal system. Scopolamine administered parenterally to rats and rabbits at doses higher than the dose delivered by Transderm Scōp did not affect uterine contractions or increase the duration of labor. Risk SummaryScopolamine is present in human milk. There are no available data on the effects of scopolamine on the breastfed infant or the effects on milk production. Because there have been no consistent reports of adverse events in breastfed infants over decades of use, the developmental and health benefits of breastfeeding should be considered along with the mother’s clinical need for Transderm Scōp and any potential adverse effects on the breastfed child from Transderm Scōp or from the underlying maternal condition. Safety and effectiveness in pediatric patients have not been established. Pediatric patients are particularly susceptible to the adverse reactions of scopolamine; including mydriasis, hallucinations, amblyopia and drug withdrawal syndrome. Neurologic and psychiatric adverse reactions, such as hallucinations, amblyopia and mydriasis have also been reported. Clinical trials of Transderm Scōp did not include sufficient number of subjects aged 65 years and older to determine if they respond differently from younger subjects. In other clinical experience, elderly patients had an increased risk of neurologic and psychiatric adverse reactions, such as hallucinations, confusion, dizziness and drug withdrawal syndrome [see Warnings and Precautions (5.2, 5.5)]. Consider more frequent monitoring for CNS adverse reactions during treatment with Transderm Scōp in elderly patients [see Warnings and Precautions (5.2)]. Transderm Scōp has not been studied in patients with renal or hepatic impairment. Consider more frequent monitoring during treatment with Transderm Scōp in patients with renal or hepatic impairment because of the increased risk of CNS adverse reactions [see Warnings and Precautions (5.2)]. Transderm Scōp contains scopolamine, which is not a controlled substance. Termination of Transderm Scōp, usually after several days of use, may result in withdrawal symptoms such as disturbances of equilibrium, dizziness, nausea, vomiting, abdominal cramps, sweating, headache, mental confusion, muscle weakness, bradycardia and hypotension. These withdrawal symptoms indicate that scopolamine, like other anticholinergic drugs, may produce physical dependence. The onset of these symptoms, generally 24 hours or more after the transdermal system has been removed, can be severe and may require medical intervention [see Warnings and Precautions (5.5)]. The signs and symptoms of anticholinergic toxicity include: lethargy, somnolence, coma, confusion, agitation, hallucinations, convulsion, visual disturbance, dry flushed skin, dry mouth, decreased bowel sounds, urinary retention, tachycardia, hypertension, and supraventricular arrhythmias. These symptoms can be severe and may require medical intervention.In cases of toxicity remove the Transderm Scōp transdermal system. Serious symptomatic cases of overdosage involving multiple transdermal system applications and/or ingestion may be managed by initially ensuring the patient has an adequate airway and supporting respiration and circulation. This should be rapidly followed by removal of all transdermal systems from the skin and the mouth. If there is evidence of transdermal system ingestion, endoscopic removal of swallowed transdermal systems, or administration of activated charcoal should be considered, as indicated by the clinical situation. In any case where there is serious overdosage or signs of evolving acute toxicity, continuous monitoring of vital signs and ECG, establishment of intravenous access, and administration of oxygen are all recommended.The signs and symptoms of overdose/toxicity due to scopolamine should be carefully distinguished from the occasionally observed syndrome of withdrawal [see Warnings and Precautions (5.5)]. Although mental confusion and dizziness may be observed with both acute toxicity and withdrawal, other characteristic findings differ: tachyarrhythmias, dry skin, and decreased bowel sounds suggest anticholinergic toxicity, while bradycardia, headache, nausea and abdominal cramps, and sweating suggest post-removal withdrawal.If over-exposure occurs, call your Poison Control Center at 1-800-222-1222 for current information on the management of poisoning or overdosage. Scopolamine, a belladonna alkaloid, is an anticholinergic. 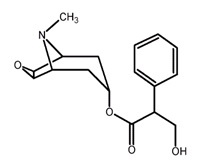 Scopolamine acts: i) as a competitive inhibitor at postganglionic muscarinic receptor sites of the parasympathetic nervous system, and ii) on smooth muscles that respond to acetylcholine but lack cholinergic innervation. It has been suggested that scopolamine acts in the central nervous system (CNS) by blocking cholinergic transmission from the vestibular nuclei to higher centers in the CNS and from the reticular formation to the vomiting center. Scopolamine can inhibit the secretion of saliva and sweat, decrease gastrointestinal secretions and motility, cause drowsiness, dilate the pupils, increase heart rate, and depress motor function. The system is formulated to deliver approximately 1 mg of scopolamine to the systemic circulation over 3 days.AbsorptionFollowing application to the skin behind the ear, circulating plasma concentrations are detected within 4 hours with peak concentrations being obtained, on average, within 24 hours. The average plasma concentration produced is 87 pg/mL (0.28 nM) for free scopolamine and 354 pg/mL for total scopolamine (free + conjugates). 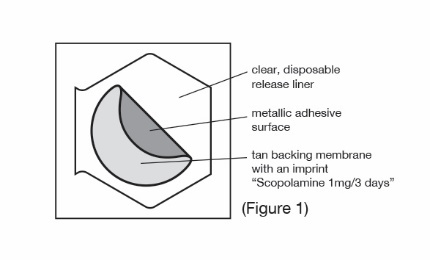 Following removal of the used transdermal system, there is some degree of continued systemic absorption of scopolamine bound in the skin layers.DistributionThe distribution of scopolamine is not well characterized. It crosses the placenta and the blood brain barrier and may be reversibly bound to plasma proteins.EliminationMetabolism and ExcretionScopolamine is metabolized and conjugated with less than 5% of the total dose appearing unchanged in the urine. The enzymes responsible for metabolizing scopolamine are unknown. The exact elimination pattern of scopolamine has not been determined. Following transdermal system removal, plasma concentrations of scopolamine decline in a log linear fashion with an observed half-life of 9.5 hours. Less than 10% of the total dose is excreted in the urine as the parent drug and metabolites over 108 hours.Drug Interaction StudiesAn in vitro study using human hepatocytes examined the induction of CYP1A2 and CYP3A4 by scopolamine. Scopolamine did not induce CYP1A2 and CYP3A4 isoenzymes at the concentrations up to 10 nM. In an in vitro study using human liver microsomes which evaluated the inhibition of CYP1A2, 2C8, 2C9, 2C19, 2D6 and 3A4, scopolamine did not inhibit these cytochrome P450 isoenzymes at the concentrations up to 1 micromolar. No in vivo drug-drug interaction studies have been conducted. No long-term studies in animals have been conducted to evaluate the carcinogenic potential of scopolamine. The mutagenic potential of scopolamine has not been evaluated.Fertility studies were performed in female rats and revealed no evidence of impaired fertility or harm to the fetus due to scopolamine hydrobromide administered by daily subcutaneous injection. Maternal body weights were reduced in the highest-dose group (plasma level approximately 500 times the level achieved in humans using a transdermal system). However, fertility studies in male animals were not performed. In 195 adult subjects of different racial origins who participated in clinical efficacy studies at sea or in a controlled motion environment, there was a 75% reduction in the incidence of motion-induced nausea and vomiting. Transderm Scōp was applied from 4 to 16 hours prior to the onset of motion in these studies. A clinical efficacy study evaluated 168 adult female patients undergoing gynecological surgery with anesthesia and opiate analgesia. Patients received Transderm Scōp or placebo applied approximately 11 hours before anesthesia/opiate analgesia. No retching/vomiting during the 24-hour post-operative period was reported in 79% of those treated with Transderm Scōp compared to 72% of those receiving placebo. When the need for additional antiemetic medication was assessed during the same period, there was no need for medication in 89% of patients treated with Transderm Scōp as compared to 72% of placebo-treated patients. 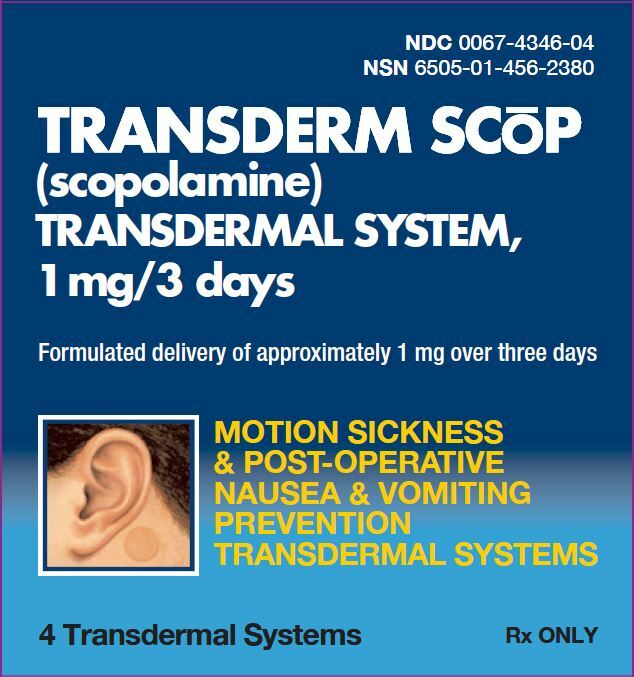 Transderm Scōp (scopolamine transdermal system) 1 mg/3 days is available as the following:Carton of 4 transdermal systems, packaged into individual foil pouches. NDC 0067-4346-04Store at controlled room temperature between 68°F to 77°F (20°C to 25°C).Store pouch(es) in an upright position.Do not bend or roll pouch(es).Wash hands thoroughly with soap and water immediately after handling the transdermal system. Upon removal, fold the used transdermal system in half with the sticky side together, and discard in household trash in a manner that prevents accidental contact or ingestion by children, pets or others [see Dosage and Administration (2.1), Warnings and Precautions (5.6)]. 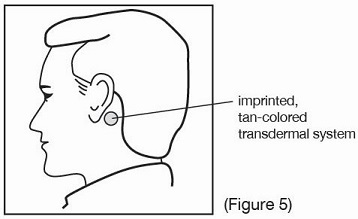 Advise the patient to read the FDA-approved patient labeling (Patient Information and Instructions for Use).Administration InstructionsCounsel patients on how to apply and remove the transdermal system [see Dosage and Administration (2.1)]: •Only wear one transdermal system at any time. •Do not cut the transdermal system. •Apply the transdermal system to the skin in the postauricular (hairless area behind one ear) area. •After the transdermal system is applied on the dry skin behind the ear, wash hands thoroughly with soap and water and dry hands. •If the transdermal system becomes displaced, discard the transdermal system, and apply a new transdermal system on the hairless area behind the other ear. 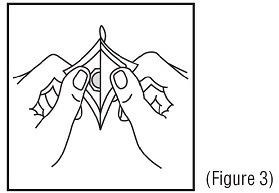 •Upon removal, fold the used transdermal system in half with the sticky side together, and discard in household trash in a manner that prevents accidental contact or ingestion by children, pets or others.Patients with Open-Angle GlaucomaAdvise patients with open-angle glaucoma to remove the Transderm Scōp transdermal system immediately and contact their healthcare provider if they experience symptoms of acute angle closure glaucoma, including pain and reddening of the eyes, accompanied by dilated pupils, blurred vision and/or seeing halos around lights [see Warnings and Precautions (5.1)].Neuropsychiatric Adverse Reactions •Advise patients that psychiatric adverse reactions may occur, especially in patients with a past psychiatric history or in those receiving other drugs also associated with psychiatric effects, and to report to their healthcare provider any new or worsening psychiatric symptoms. •Advise patients to discontinue Transderm Scōp and contact a healthcare provider immediately if they experience a seizure. •Advise patients, especially elderly patients, that cognitive impairment may occur during treatment with Transderm Scōp,especially in those receiving other drugs also associated with CNS effects, and to report to their healthcare provider if they develop signs or symptoms of cognitive impairment such as hallucinations, confusion or dizziness. •Inform patients not to operate motor vehicles or other dangerous machinery or participate in underwater sports until they are reasonably certain that Transderm Scōp does not affect them adversely [see Warnings and Precautions (5.2)].Decreased Gastrointestinal Motility and Urinary RetentionInstruct patients to remove the transdermal system if they develop symptoms of intestinal obstruction (abdominal pain, nausea or vomiting) or any difficulties in urinating [see Warnings and Precautions (5.4)].Drug Withdrawal/Post-Removal SymptomsInform patients that if they remove the Transderm Scōp transdermal system before treatment is complete, withdrawal symptoms may occur and to seek immediate medical care if they develop severe symptoms after removing Transderm Scōp [see Warnings and Precautions (5.5)].Blurred VisionInform patients that temporary dilation of the pupils and blurred vision may occur if Transderm Scōp comes in contact with the eyes. 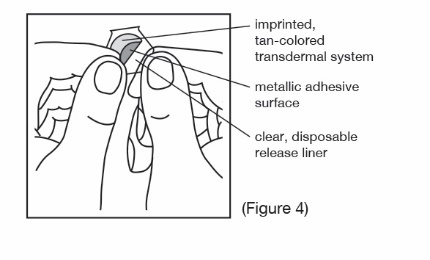 Instruct patients to wash their hands thoroughly with soap and water immediately after handling the transdermal system [see Dosage and Administration (2.1), Warnings and Precautions (5.6)].MRI Skin BurnsInstruct patients to remove the Transderm Scōp transdermal system before undergoing an MRI [see Warnings and Precautions (5.7)].Manufactured by: ALZA Corporation, Vacaville, CA 95688 forGSK Consumer Healthcare, Warren, NJ 07059Trademarks are owned by or licensed to the GSK group of companies.©2019 GSK group of companies or its licensor. All contents of this website are provided on an "as is" and "as available" basis without warranty of any kind. The contents of the National Drug Codes List website are provided for educational purposes only and are not intended in any way as medical advice, medical diagnosis or treatment. Reliance on any information provided by the National Drug Codes List website or other visitors to this website is solely at your own risk. Many of Over the Counter drugs are not reviewed by the FDA but they might be marketed to the public if the product complies with the applicable rules and regulations. The information in this website is intended for healthcare providers and consumers in the United States. The absence of a warning or notice for a given drug or drug combination is not indication that the drug or drug combination are safe, appropriate or effective for any given patient. If you have questions or concerns about the substances you are taking, check with your healthcare provider.